Oi. You. Yes, you. It’s time to let you in on a little secret. Ready? You don’t need to wear a suit. Well, rarely, at least. Contrary to popular belief, you can turn yourself out smartly for most occasions without the hassle of trussing yourself up in tailoring. It’s a knee jerk reaction: we hear the word ‘formal’ and instantly reach for the dinner jacket, but women don’t have to follow quite such strict codes and, in the 21st century, why should men? Here, we’ll show you five fail-safe combos that make use of commanding colours, silhouette-enhancing knits and relaxed tailoring to prove you can look sharp without defaulting to a two-piece. Theories on the roll neck’s recent comeback abound. Like a Kanye West album, they were buzzed about for ages in the press – yet rarely spotted – and then, boom, suddenly they’re everywhere. Also like Kanye, everyone’s talking about them, falling into the for or against camps. But while a certain record about some guy called Pablo has faded from memory not long after launch, roll necks have quickly cemented their status as a modern menswear staple. A fine-gauge version will create a much sleeker silhouette than a crew neck jumper, something that – despite the roll neck’s comparable comfort – says you made the effort. Try one in black, navy, burgundy or charcoal, add a pair of slim wool trousers and finish with a pair of brogues and you’ve tapped into the unofficial men’s work uniform of 2016. As you might have guessed, high-quality knitwear is your ultimate wingman when it comes to dressing smart without suiting up. Chunky merino, cashmere or cotton shawl collar cardigans and knit blazers help give your body shape and definition that T-shirts can’t, but they’re just as easy to wear. You can thank Lanvin and its man at the helm, Lucas Ossendrijver, for keeping knit blazers on a contemporary keel. The Parisian label regularly includes them in collections, and for good reason: they’re comfy enough to wear all day and light enough to layer, but still look slicker than wool has any right to. High street and mid-range brands have quickly followed suit, so it’s easy to find a style in your price range and, as a bonus, knit jackets often cost a bit less than their tailored counterparts. A T-shirt underneath can skew a touch too casual here, so try throwing yours over a lightweight Oxford shirt on warmer days, or a crew neck jumper in a paler colour when it’s chilly out. For an office-ready approach, pull on a textured neck tie and no one will notice you sidestepped the suit. If you don’t particularly enjoy wearing suits but can’t quite put your finger on why, then know that it’s probably ‘structure’ which is the source of your woes – i.e. the lining, padding and other bits of smoke and mirrors used to give the illusion of a nip here and a tuck there. Scrap that stuff, as tailor Gennaro Rubinacci did in the 1930s and Giorgio Armani did in the 1980s, and you’re left with the shell of the suit jacket – all the smartness, none of the suffocating fuss. The effect is a lighter, easily thrown-on, almost cardigan-like piece. 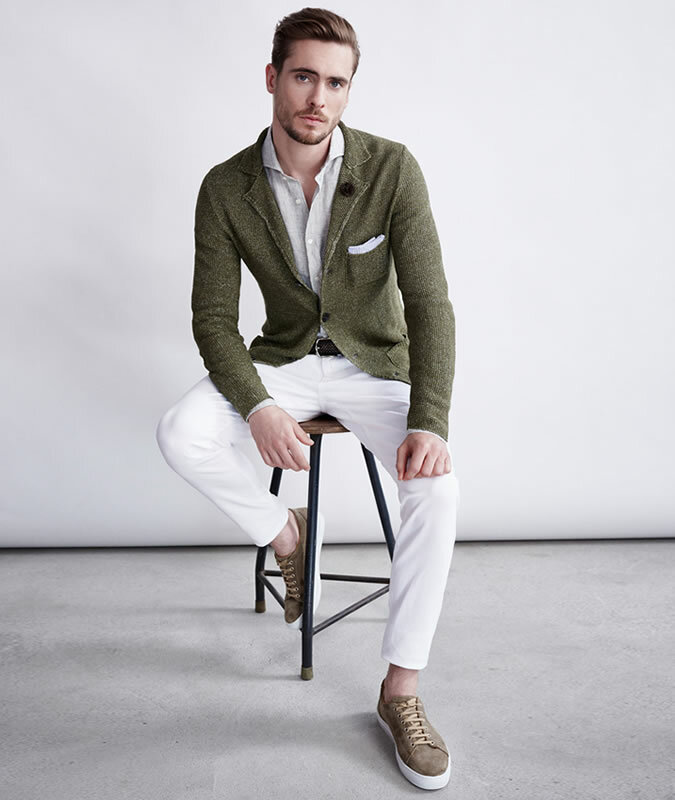 The more relaxed silhouette also means you can play loose with the colours, so try khaki, beige or powder blue, and team with a linen or washed cotton jumper underneath in a darker hue. 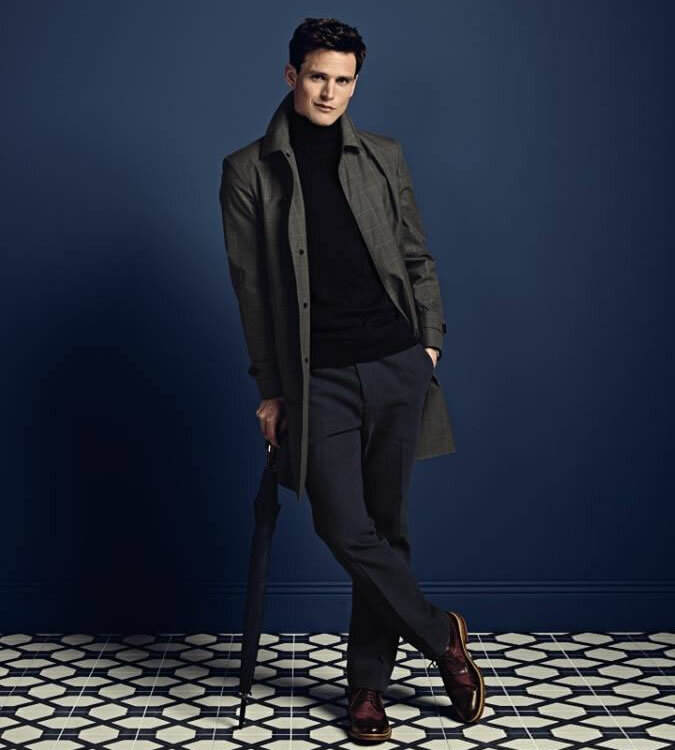 A more structured jumper can provide some pleasing contrast here too, such as a textured honeycomb or waffle pattern, while slim tailored trousers or chinos polish the look off. It’s a perfect summer outfit, ideally served on a balcony as the sun goes down, with a negroni or two (we’re not judging) in hand. It’s a well-worn menswear trope that adding smart shoes to any outfit automatically makes it look smart. But there is some truth to this. If, for example, you’re a denim addict who freaks out at the idea of having to wear tailoring, you can make your raw jeans scrub up for the evening with a pair of sleek (ideally suede to dial down the formality) monk-straps, brogues or Derbies. Add in a chunky textured knit and Oxford shirt and you’ve got a day-to-night formula that never fails. There are a few rules to making this work, though. Selvedge denim isn’t the best fit, as its paler underside can seem too ‘workwear’-y. Also important is sticking to a solid knit that’s not too sloppy in structure or oversized in fit – ribbed, textured or flecked crew necks and cardigans in slim cuts are what the doctor ordered. And don’t try to pull a fast one with a pair of Oxfords here; the style is too formal to sit alongside denim. Chunky-soled Derbies – something like Dr Martens’ Immanuels, or Grenson’s Archie brogues – offer just the right amount of heft to balance out a robust knit while keeping the jeans the right side of smart. Just because you want to dress up, it doesn’t necessarily mean tees are out of the question. A good T-shirt (100 per cent cotton, perfectly fitted) in a subtle block-colour can actually make a suit look smarter (and definitely more contemporary) than a bog-standard formal shirt. Instead of a full two-piece suit, wear just the blazer and swap the trousers for slim chinos – you’ve got an outfit that’s the opposite of try-hard (and endlessly customisable, too). 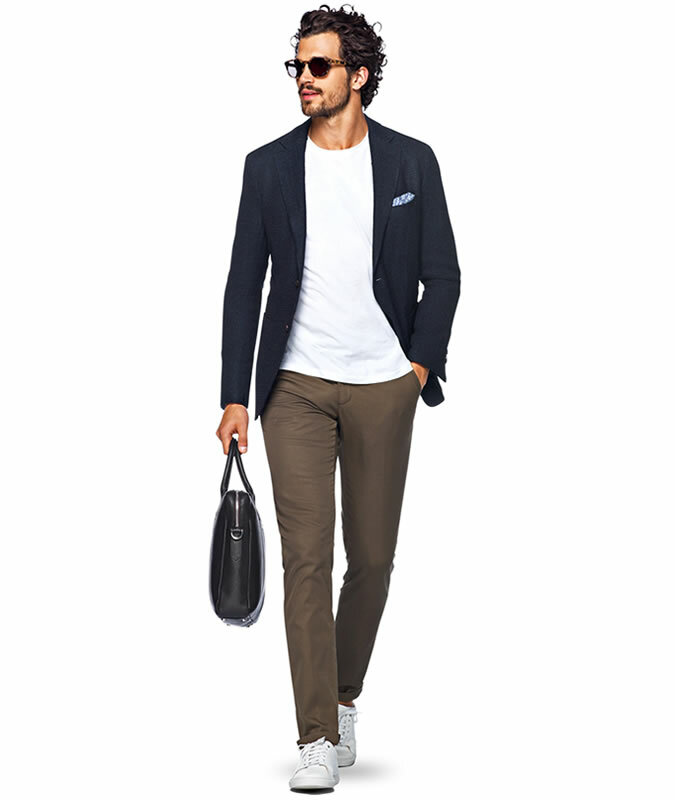 Try a jacket in black or navy, dark grey chinos and a crisp white tee worn with a pair of smart shoes or minimal leather trainers. Boots fit well with this ensemble too, and you could even add a raffish silk or linen scarf into the mix. Do you agree that you can get by (or even look better) by ditching the suit altogether when smarts are called for? Or do T-shirts and knits scream ‘out of office’ to you?